Dell has been a Microsoft customer for decades. Soon, Microsoft may be calling the shots. According to CNBC, Microsoft (MSFT) is in talks to invest $1 billion to $3 billion in the PC maker as part of a move to take Dell private. If Dell (DELL) is bought out for its present $23 billion market value, that would give Microsoft a 4% to 13% stake in the company. CEO and founder Michael Dell's 16% stake is worth roughly $3.5 billion, so he would still control a bit more than his ally in Redmond, Wash., if CNBC's report is accurate. Representatives from both Dell and Microsoft declined to comment. 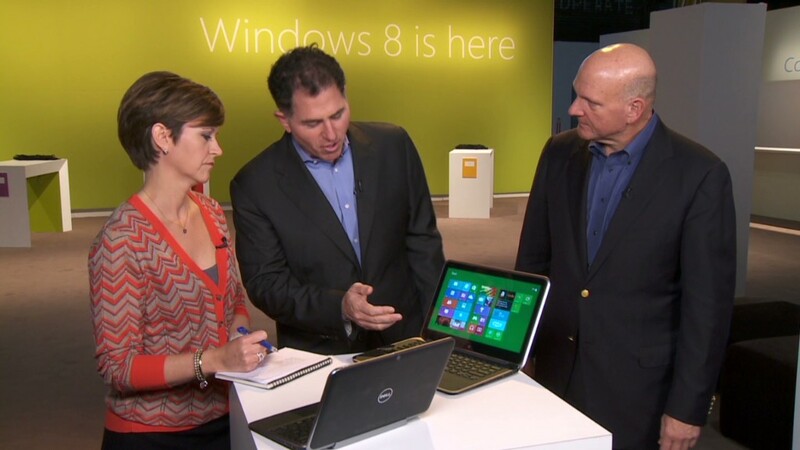 For instance: Dell's tablet line right now exclusively runs Windows 8. If those devices still haven't gained traction by the middle of this year, Dell might go looking outside the Windows ecosystem. It's done that before, using Google's Android to power its Dell Streak line. Those poorly reviewed gadgets are now discontinued, but Android remains a threat. Related story: Michael Dell's grand plan? "An obvious alternative would be to sell an Android tablet a la Google to compete with the Nexus 7 and Nexus 10," suggested Carl Howe, an analyst at Yankee Group. "How would that decision play with Microsoft as a strategic investor? My guess is not so well." Controlling both the software and hardware is a model that works particularly well for Apple (AAPL). Google made a similar move last year in acquiring Motorola Mobility. Android was starting to slip from Google's grasp, with manufacturers rapid-firing too many disappointing devices into the market with no clear-cut design strategy. Google (GOOG) plans to focus Motorola exclusively on high-end devices and use the company to promote its vision of the Android platform. So why not just buy all of Dell, as Google did with Motorola? That's too big a risk, analysts say. "Microsoft shouldn't be perceived as favoring one hardware maker over another," said Ronald Gruia, principal consultant at Frost & Sullivan. "That's the last thing Microsoft needs." Taking a stake could be enough to help mold Microsoft's vision for Windows. For Dell, though, having to serve Microsoft as its overlord might not play out so well. The company lost a third of its market value in 2012 and failed to keep up with rivals like Apple and Samsung. They've done a much better job adapting to the "post-PC" landscape with innovative tablets and smartphones. "The point of going private is so you can serve your own long-term goals without having to worry about short-term performance," said Yankee Group's Howe. "Having an outside investor -- Microsoft -- muddies those waters. I think Dell would have a more certain future going it alone."